James Williams was a central figure in the study of the natural environment and human history of the region of Dumfries and Galloway for almost 50 years. During this time he safeguarded and expanded knowledge of the region and made it available to both the local community and academic interests nationally and internationally. James (known to some as Jimmy or Jim) will long be remembered for his voluntary and dedicated contribution to Dumfriesshire and Galloway Natural History and Antiquarian Society (DGNHAS), which he joined in 1964. He served the Council of the Society in various capacities, such as Secretary and Librarian. However, it was as co-editor along with the late Bill Cormack and latterly as senior editor of the Society's Transactions that he excelled and left an indelible mark. He was involved in 30 editions, including the one currently being printed, and other publications of the Society, most important of which was Kirkpatrick Fleming, Dumfriesshire — An Anatomy of a Parish in South West Scotland by Roger Mercer and others. The Transactions is a local studies journal which dates back to 1862. Thanks to his voluntary endeavours, diligence and wonderfully retentive memory the journal, which has a deservedly high reputation for the quality of content, has been able to maintain its editorial standard at the highest level of academic publishing. Had his contribution been limited to that of editor it would have been a praiseworthy enough achievement for one person; but his meticulous research enabled him to contribute a stream of papers from 1962 to present times. On his own initiative he set up the Society's website in 2000, which he maintained as long as he was able. In addition he responded to academic inquiries from all corners of the globe. He had begun single-handedly the Herculean task of digitising the Society's Transactions to enable DVDs to be issued in response to such queries. He lived virtually his entire life in Dumfries and Galloway. He was educated at St Joseph's College, Dumfries, where he developed a lifelong interest in Chemistry, Mineralogy and local History. He acquired the residue of the school's mineral collection to which he added specimens from the three counties of South-West Scotland. He donated some of the unique minerals he found to the National Museum of Scotland. He was particularly proud of a piece of Jasper discovered as a beach boulder on the Kirkcudbrightshire coast. When the Grierson Museum at Thornhill was dispersed 1965-1967 he provided the mineralogical cataloguing for the process. His very first publication in the Transactions was The Mineralogical Collection of the Dumfries Burgh Museum. His work in the field of Mineralogy earned him a sizeable entry in Alec Livingstone's book, Minerals of Scotland. Employed at ICI, Dumfries, James served as an experimental chemist specialising in polymers. 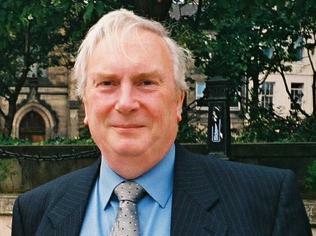 At the time of his early retirement in 2000 he had worked at the Dumfries site for 36 years and was Quality Assurance Manager for Dupont Films (Dumfries and Europe). After retirement he continued part-time for a further seven years to establish new laboratory facilities for Plastic Technology Services. Early in his career he was sent on a Microscopy course, as a result of which he developed a skill and fascination that remained throughout his life. Much of the work was polymer based but there was a strong emphasis on contamination and failure analysis, which involved forensic skill processes. He became a Fellow of the Microscopical Society in 1986. Another life-long passion remained his antiquarian interests and the organisation of collections, coupled with the communication of knowledge. The unpublished memoirs of the former Curator of Dumfries Museum, Alfred E. Truckell, MBE, MA, and Fellow of the Museums Association, record the arrival of James, "a shy lad of sixteen" in 1960. At that time Truckell was the sole professional on the museum staff. In his day he was a legend in the field and he welcomed James as his protegé — and unpaid assistant. He recalls how James was equipped with a good knowledge of Mediaeval History and how he rapidly became a competent archaeologist, developing a sound grasp of the archaeological features of Dumfries and Galloway and practical skills in investigation and excavation. He actively assisted Truckell in the field by organising squads of young volunteers to mount investigations of local sites, such as Carzield Roman Fort and the Iron Age forts of Mote of Mark and Tynron Doon. He assumed responsibility for cataloguing the finds and publication of the results. He was responsible for identifying many previously unknown sites and collecting material from across the region from Luce Sands in the west to Dalton in the east. These included Mesolithic flint tools of the first settlers ranging to late Mediaeval ceramics from the castles and abbeys that characterise the region. In all he has collected over 500 archaeological assemblages. Without this dedicated work, understanding of the prehistorical past in S.W. Scotland would be much less detailed. He became the youngest Fellow of the Society of Antiquaries of Scotland at the age of 20 in 1963. Other responsibilities shouldered by him included serving as DGNHAS representative on the Whithorn Trust from 2003 and as a Church of Scotland elder of Lochrutton and later Maxwelltown Churches for 33 years. After a fracture to the femur in June 2007 he was diagnosed with multiple myeloma cancer. Thereafter he received exemplary care from the dedicated haematology staff at Dumfries and Galloway Royal Infirmary and at the Beatson West of Scotland Cancer Centre, Glasgow. He achieved remission and valiantly tried to lead a normal life but unfortunately the aggressive nature of his particular myeloma was overwhelming. In 1970 he married his wife, Pauline, who shared a number of his interests. She and their three children, James, Allan and Sarah survive this devoted family man, whose diligence and dedication has left a remarkable legacy for academe. "Good Saint Ninian carved his strong faith in stone." From the school song of St Joseph's College, Dumfries.